257 viewsA Frank Gehry designed complex, originally built as a distribution center for Herman Miller; now a private university. 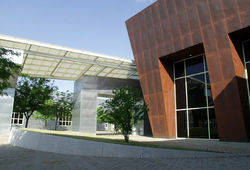 The architecture for both the original complex and retrofit of the university received international recognition. The high tech design employs metal panels riveted together. 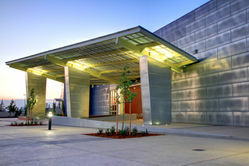 Built on a black rock pad about the size of a football field the retrofit includes bright colored dorm buildings 'inside' the largest building, now a roofless grid between structures. Lighting and indoor outdoor halls. William Jessup University-contact Placer-Lake Tahoe Film Office468 viewsA Frank Gehry designed complex, originally built as a distribution center for Herman Miller; now a private university. The architecture for both the original complex and retrofit of the university received international recognition. 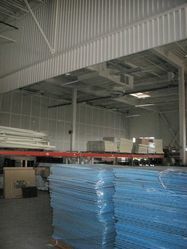 The high tech design employs metal panels riveted together. 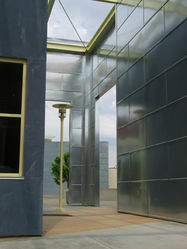 Built on a black rock pad about the size of a football field the retrofit includes bright colored dorm buildings 'inside' the largest building, now a roofless grid between structures. 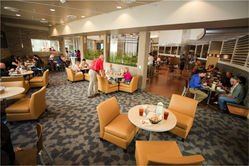 Lighting and indoor outdoor halls. William Jessup University-contact Placer-Lake Tahoe Film Office483 viewsA Frank Gehry designed complex, originally built as a distribution center for Herman Miller; now a private university. The architecture for both the original complex and retrofit of the university received international recognition. The high tech design employs metal panels riveted together. 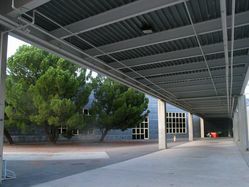 Built on a black rock pad about the size of a football field the retrofit includes bright colored dorm buildings 'inside' the largest building, now a roofless grid between structures. 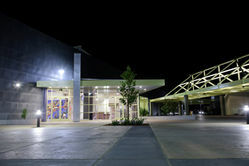 Lighting and indoor outdoor halls. William Jessup University - contact the Placer-Lake Tahoe Film Office265 viewsA Frank Gehry designed complex, originally built as a distribution center for Herman Miller; now a private university. 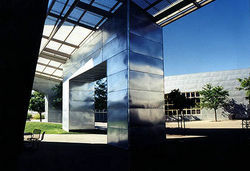 The architecture for both the original complex and retrofit of the university received international recognition. The high tech design employs metal panels riveted together. 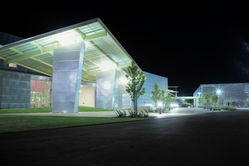 Built on a black rock pad about the size of a football field the retrofit includes bright colored dorm buildings 'inside' the largest building, now a roofless grid between structures. Lighting and indoor outdoor halls. William Jessup University-contact Placer-Lake Tahoe Film Office330 viewsA Frank Gehry designed complex, originally built as a distribution center for Herman Miller; now a private university. 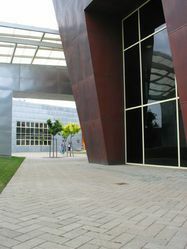 The architecture for both the original complex and retrofit of the university received international recognition. The high tech design employs metal panels riveted together. 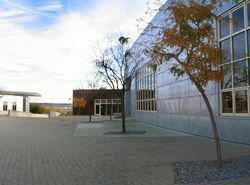 Built on a black rock pad about the size of a football field the retrofit includes bright colored dorm buildings 'inside' the largest building, now a roofless grid between structures. Lighting and indoor outdoor halls. William Jessup University325 viewsA Frank Gehry designed complex, originally built as a distribution center for Herman Miller; now a private university. The architecture for both the original complex and retrofit of the university received international recognition. The high tech design employs metal panels riveted together. 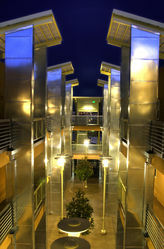 Built on a black rock pad about the size of a football field the retrofit includes bright colored dorm buildings 'inside' the largest building, now a roofless grid between structures. Lighting and indoor outdoor halls. 2257 viewsA Frank Gehry designed complex, originally built as a distribution center for Herman Miller; now a private university. The architecture for both the original complex and retrofit of the university received international recognition. The high tech design employs metal panels riveted together. 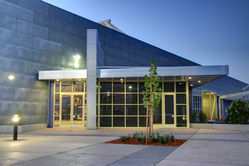 Built on a black rock pad about the size of a football field the retrofit includes bright colored dorm buildings 'inside' the largest building, now a roofless grid between structures. Lighting and indoor outdoor halls. 542 viewsA Frank Gehry designed complex, originally built as a distribution center for Herman Miller; now a private university. The architecture for both the original complex and retrofit of the university received international recognition. The high tech design employs metal panels riveted together. 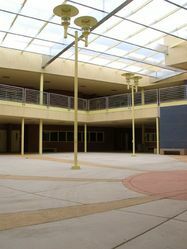 Built on a black rock pad about the size of a football field the retrofit includes bright colored dorm buildings 'inside' the largest building, now a roofless grid between structures. Lighting and indoor outdoor halls. 815 viewsA Frank Gehry designed complex, originally built as a distribution center for Herman Miller; now a private university. 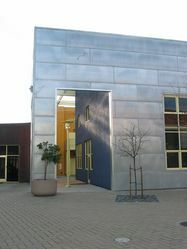 The architecture for both the original complex and retrofit of the university received international recognition. The high tech design employs metal panels riveted together. 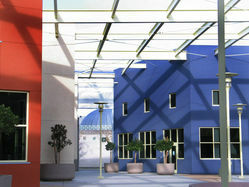 Built on a black rock pad about the size of a football field the retrofit includes bright colored dorm buildings 'inside' the largest building, now a roofless grid between structures. Lighting and indoor outdoor halls. 2662 viewsA Frank Gehry designed complex, originally built as a distribution center for Herman Miller; now a private university. 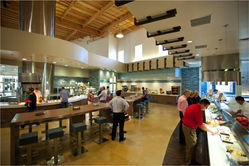 The architecture for both the original complex and retrofit of the university received international recognition. The high tech design employs metal panels riveted together. 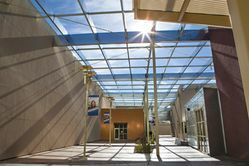 Built on a black rock pad about the size of a football field the retrofit includes bright colored dorm buildings 'inside' the largest building, now a roofless grid between structures. Lighting and indoor outdoor halls. 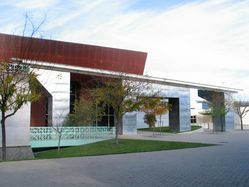 William Jessup University-contact Placer-Lake Tahoe Film Office1527 viewsA Frank Gehry designed complex, originally built as a distribution center for Herman Miller; now a private university. The architecture for both the original complex and retrofit of the university received international recognition. The high tech design employs metal panels riveted together. 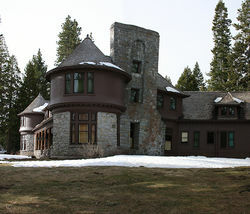 Built on a black rock pad about the size of a football field the retrofit includes bright colored dorm buildings 'inside' the largest building, now a roofless grid between structures. Lighting and indoor outdoor halls. 801 viewsA Frank Gehry designed complex, originally built as a distribution center for Herman Miller; now a private university. The architecture for both the original complex and retrofit of the university received international recognition. 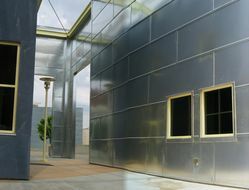 The high tech design employs metal panels riveted together. 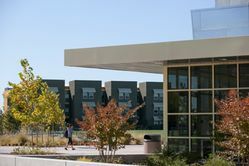 Built on a black rock pad about the size of a football field the retrofit includes bright colored dorm buildings 'inside' the largest building, now a roofless grid between structures. Lighting and indoor outdoor halls.